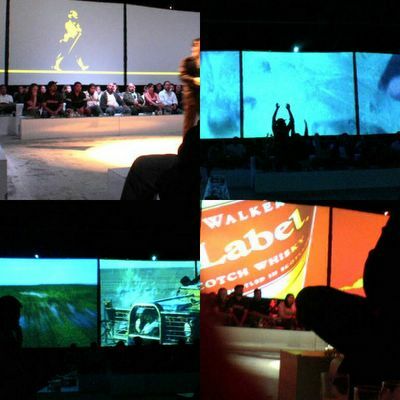 From time to time I have a burst of hits to my site from people searching the internet for information about Johnnie Walker's Journey of Taste, a whisky sampling event that I wrote about in late 2004. If you read that review you will discover that Fred and I found the proceedings to be rather boring. You would be surprised we might even consider attending another one ever again. But when we found out that their latest event was taking part within walking distance from our current home, at the Dogpatch Studios, we decided to give it another shot. The great news is that the event has improved no end. Johnnie Walker have brought their tasting bang up to date with a new presentation which will undoubtedly appeal to the younger audience they are hoping will become the Johnnie Walker drinkers of the future. Although the evening starts much in the same way as it did before, with a lengthy queue to get in, followed by a short mingling period accented with nibbles (delicious mini-burgers) and one of two Johnnie Walker cocktails or a Black Label on the rocks, the actual tasting part of the evening has seen a major facelift. Gone are the kilts, the bag-pipes, the corporate movie, the scratch'n'sniff card and the educational-style tasting. In its place we found a quadrangle of cool white bench seating framed by four huge video walls that play fashionably-styled fast-cut images to the rhythm of loud bursts of music that energizes the audience. At one point a Mexican wave even started to travel around the room. Johnnie Walker have increased the number of samples in their tasting too, even introducing me to one blend that I wasn't aware existed. We started by sipping the Black Label, described by the Ambassador as their benchmark blend. Next up was the surprise, the Gold Label, which was served ice cold, straight from the freezer which our Ambassador claimed matches perfectly with chocolate mousse. This is a soft, more honeyed whisky with vanilla overtones. The red label is their most affordable brand which they encouraged us to mix with one of the soft drinks provided. (Because it doesn't taste so great on its own, of course!) The Green Label otherwise known as Pure Malt, only recently available in the US, is a blend of 15 single malts. The final sample of the evening, because this is not a drink for beginners, was their expensive Blue Label, blended from rarer whiskies. A Johnnie Walker Journey of Taste isn't such a bad way to while away an hour and a half, especially if you think you'd enjoy the opportunity to compare each of their blends against each other. But remember - these are all blends. If fine single malts are more your style you might be a little frustrated with this basic introduction to Scotch. How appropriate. A coworker and old friend Ed, came in the other day with the leavenings of a blue label bottle. We poured and sipped and then guzzled. Everyone remarked about the fab spiffyness of the stuff. It was then that Ed said it was about 200 dollars a bottle, or somewhere around there. Ah well. Please give my regards to Fred. I was there last night too, at the 8:30 tasting. And as someone who regularly does comparative tastings (of other beverages) in my job, I had to say I was a little disappointed that we didn't get to talk more about what it was we were tasting. The "ambassador" was more interested in providing appropriate "moments" during which to enjoy each blend. I had different expectations of the evening, and I guess I'm approaching it from another angle. The slick presentation brought out the cynic in me, but it was also marginally impressive. Out of all of the ones we tasted, I think I liked the Gold Label best, although the toasted coconut caramel aroma in the Black Label was pretty impressive. Oh, my head hurts just thinking about it. Is "mixing scotch" like the kind we used in college – mixing scotch, vodka, gin, and whatever else into one big trash bag with a whole lotta juice and then seeing who could drink the most? So it's all round to your pope for a cup of rosey, easy on the acker though, and a slice of Joe. Oh and don't forget to brush your hampsteads all they'll all fall out. Dr B - $200 a bottle, eh? I dont think I would spend that much on it. Needless to say the samples they gave us were definitely frugal. Ms Glaze - unfortunately the samples weren't quite big enough to make a competition of it. Wheresmymind - except in Galway you'd be drinking whiskey, not whisky. Ann - i think i remember getting an invite to the dessert event but decided to give it a miss. Gentleman-hobbs - you're going to be confusing my American readers.